I just took my first weekend trip for my extracurricular project, co-authoring the latest edition of Vermont, An Explorer's Guide. I stayed in Dorset at the newly updated Barrows House, where I had an exceptional dinner at the hotel's new gastropub. But more on that another time. For lunch the next day, I headed further south towards Peru, home of what was Vermont's longest-running general store. 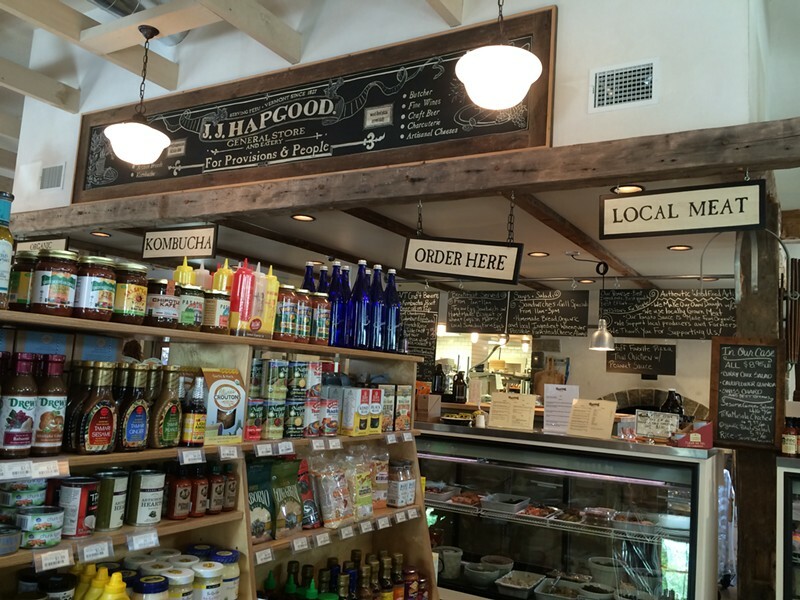 J.J. Hapgood General Store opened in 1827. After a four-year closure, it reopened last year with a wood-fired oven and a deep stock of hard-to-find gourmet products. Though I was tempted by take-home treats such as Flowery Lavender caramel from Spoonable, "Brooklyn's saucy caramel," it was lunchtime, and a doughnut and strawberries from the Dorset Farmers Market were no longer sustaining me. I ordered at the counter and picked up a Fentiman's Cherrytree Cola, which the Brit company bills as "the world’s first botanically brewed cherry cola." Think of the cherry Coke equivalent of Rookie's Root Beer (on tap at J.J. Hapgood, coincidentally) and you'll understand why I'm not a fan. Then we waited. And waited. 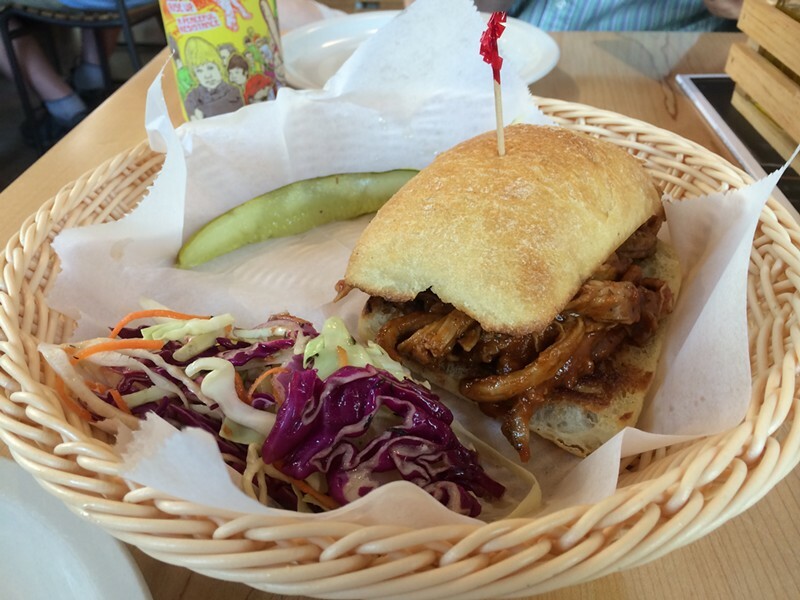 At length, our pulled-pork sandwich arrived. The local pork within was roasted, not smoked, and still betrayed a little more bounce than I was expecting. The meaty chunks were dressed in sauce made from Sugar Bob's Finest Kind smoked maple syrup, made in nearby Landgrove. Despite that promise of smoke, the sticky-sweet sauce was surprisingly one-note. I was glad that I'd added a side of heavily vinegared slaw. The thick, crusty ciabatta roll also helped to mitigate the sugar high. We were nearly finished with the sandwich by the time our pizza arrived. Pretty, right? 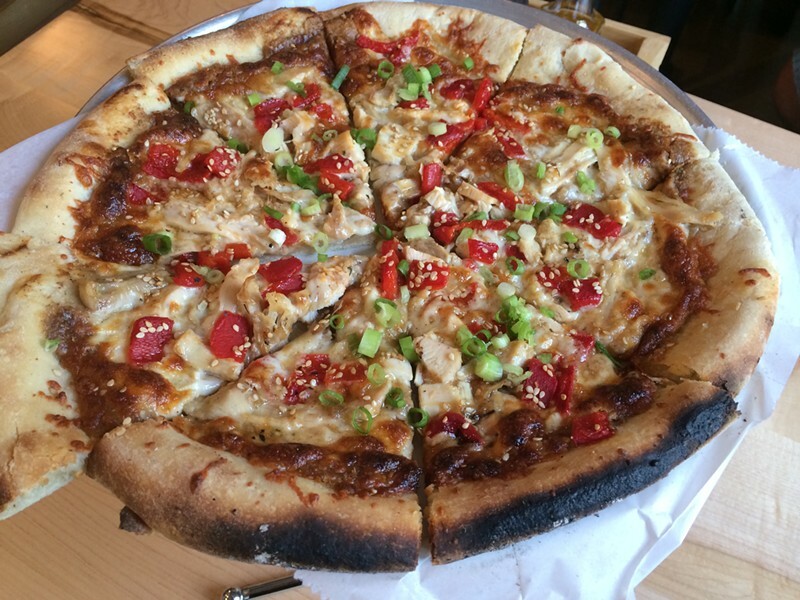 We chose what was trumpeted as the "staff favorite" at the counter, the Thai Peanut & Chicken pizza. The flavors were a success: Mildly spiced peanut sauce served as a base for Misty Knoll Farms chicken, tender cubes of red pepper and a shower of scallions, all held together with a browned layer of mozzarella. It was super-cool to learn that the crust was made from organic flour from Nitty Gritty Grain Company. The pungent dough tasted slightly cheesy in its own right, which reminded my dining partner of Brazilian pao de queijo (a server assured us there was no actual cheese in the crust). But despite an uncommonly enticing flavor, the crust lacked any of the stretchy chew I desire from a glutenous pastry product. My stiff pizza bones remained uneaten. 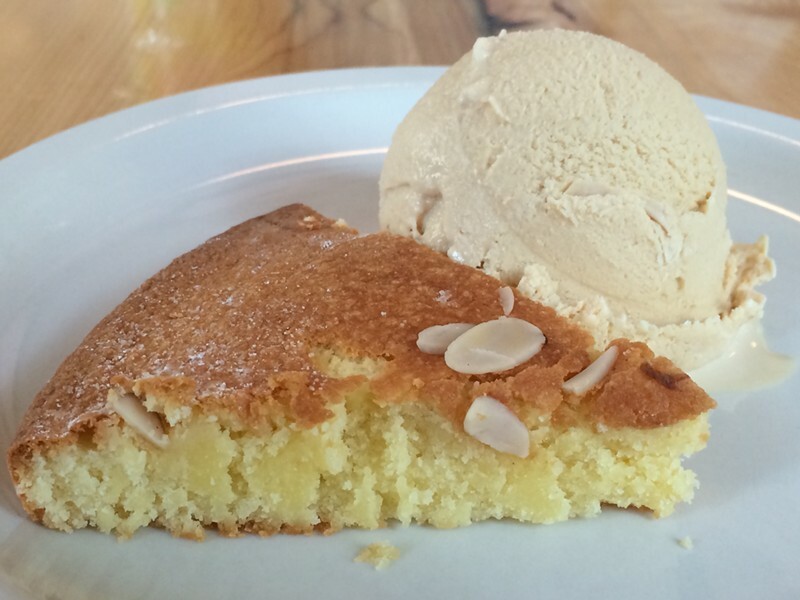 But the pastry gods smiled on J.J. Hapgood with its gluten-free almond torte. Though moist and light within, the dessert had a gratifyingly chewy exterior. Was it worth $5,50 for a slice? It was to me, especially when paired with a scoop of salted caramel ice cream from the Greenwich, N.Y., artisan shop the Ice Cream Man. The small scoop was hefty in texture and tasted of dark, intense caramel. Some more salt in the mix would have worked to its advantage, but I can honestly say it was the finest plated dessert I've ever eaten in a 187-year-old general store. Next time I'm in the area I might get lunch itself elsewhere, but I know exactly what will satisfy my sweet tooth.